This news is five days old, but perhaps I’m not the only one who has been on the road and out of touch. The young Chicago trumpeter Marquis Hill won the Thelonious Monk Institute’s big award. Charles Gans of the Associated Press included that fact as the final paragraph in his story about a retired tenor saxophonist and government official, seen above with pianist Herbie Hancock at the ceremony. For the full AP story, go here. For a sample of Hill’s work with his Blacktet, see the video below. Hill, trumpet; Dustin Laurenzi, tenor saxophone; Justin Thomas, vibraphone; Joshua Ramos, bass; Makaya Mccraven-drums. 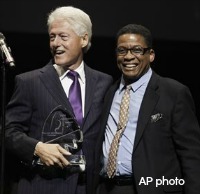 Nate Chinen’s New York Times report has more about Hill and the Monk Institute award ceremony in Los Angeles. Great sound from an interesting group! Thanks for posting. A very interesting young group. Mr. Hill has a terrific sound. With luck and good bookings, he should have a long and creative career.